Ulefone this week introduced its new high-end shockproof and waterproof smartphone. Dubbed the Ulefone Armor 6, the rugged phone combines an IP68-rated chassis, a large display, multiple special-purpose sensors, and a high-performance SoC. 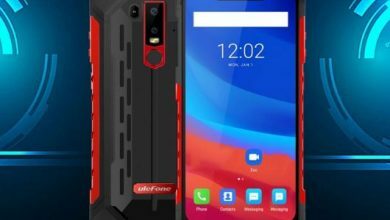 Clearly keying in on a specific market segment for the new phone, the Ulefone Armor 6 will also ship with multiple pre-loaded applications that are intended to be useful during traveling or just in various harsh locales. On the outside, the Armor 6 has a rather decent looking chassis featuring a die-cast frame covered with protective rubber and red or grey metallic inlays. The enclosure is rated to handle drops from 1.2 meters, submersion into water (up to 1.5 meters for up to 60 minutes), thermal shocks, corrosive environments, and so on. Meanwhile, framing a 6.2-inch 2246×1080 LCD display protected using Corning’s Gorilla Glass 5, the Armor 6 is generally pretty large and heavy: it is 160 mm tall, 13.3 mm thick, and weighs 228 grams. All of which makes the Armor 6 a lot larger than standard consumer smartphones, but is fairly typical for this market segment. Broadly speaking, most rugged smartphones have to make trade-offs to reach their design goals, such as using an inelegant chassis, mediocre hardware inside, or rather ordinary displays. While the general reasons behind such design decisions are more or less obvious (e.g., keep their BOM costs and heat soak in check), there are many people who prefer to have a rugged smartphone without making quite so many compromises. The Ulefone Armor 6, in turn, is looking to carve out a niche for itself in that market by offering a rugged design with above-average hardware. But a device is only as useful as the functionality it can provide. That’s why Ulefone has packed all the necessary hardware in the Armor 6. The brain of the phone is MediaTek’s Helio P60 12nm AI-powered chip running Android 8.1 and paired with generous 6GB of RAM and 128GB of storage, giving you plenty of space to store all the images and videos you’ll take during your adventures. Of course, venturing to exciting corners of our planet means you’ll be away from conveniences such as electricity for extended periods of time. The Armor 6 has your back in that regard as well with its enormous 5000mAh battery. It will take a while before you drain all that power from your smartphone, but when you eventually do need to top it up, the 18W fast charge support will ensure you have a full tank in no time. But, in addition, the smartphone also has IP68 protection against water and dust, which will allow it to survive 1.5 meters deep for an hour. Beyond that, you get a bunch of other features like dual SIM support, fingerprint sensor and face unlock, accurate GPS thanks to both Glonass and Beidou navigation systems and NFC with support for Google Pay for when you’re back in the city. Speaking of images and videos, those will be provided by the dual 21MP+13MP rear camera working in tandem with the AI processor to give you the best possible shots, whether that is a stunning panorama taken from a mountain top or a close-up of some unique sea creature. as well as an 8 MP selfie camera with a ƒ/2.0 large aperture. Expensive after the coupon as well. for rugged phone such price to too much because you need proper rugged phone with real tough features. I suggests you Poptel P60, because of price and combination of proper rugged phone.